BESPOKE ROMANCE IN ANANTARA STYLE. 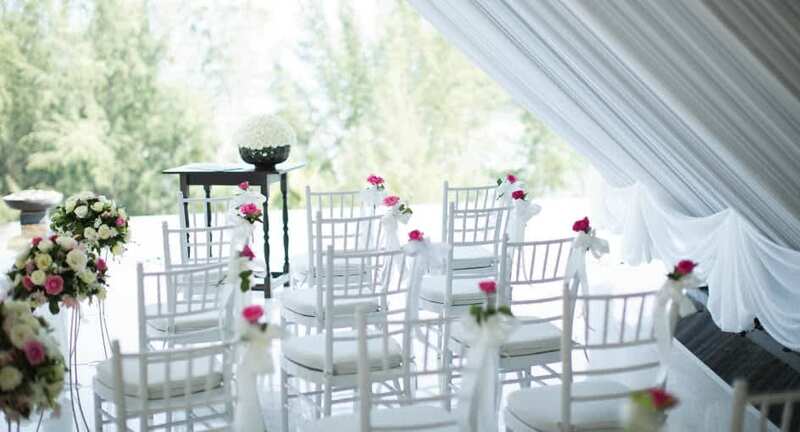 An oceanfront venue for your dream wedding in Phuket. At Anantara Layan Phuket Resort, romantic celebrations can be as intimate or lavish as you please. Say ‘I do’ in a secluded cove of powder-white sands and azure lapping waters. Renew your vows in a wedding chapel with sweeping ocean views making it stand out among the Phuket wedding hotels available. Hold a traditional Thai blessing ceremony surrounded by family and friends against a panorama of jewel tones. March down an aisle of petals to a gazebo in front of the ocean. Indulge in a traditional white wedding in a thoroughly tropical paradise. Ideal for up to 250 guests. Intricately decorated wooden doors open to reveal an uninterrupted ocean vista. A soaring ceiling and all-white backdrop is punctuated by tropical bouquets and ornate chandeliers. Ideal for up to 36 guests. On a stunning hillside setting overlooking the Andaman Sea, Layan Residences provide the ultimate in privacy and flexibility. Hold a traditional blessing in a Thai sala. Celebrate into the night beside a pool dotted with floating candles. Ideal for up to 70 guests.